The 1893 N142 Duke Cabinets Baseball Card Set includes 4 cards measuring 6" x 9 1/2". Even though there are only 4 baseball subjects in this set, 3 of the 4 are now in the hall-of-fame. The card fronts feature a color portrait (something that was a rarity on 19th century baseball cards), with player name in the frame below and "Honest" on the left hand side. The Duke Cabinets card backs are blank. The three hall-of-famers included in this set are: George Davis, Ed Delahanty and Wilbert Robinson. 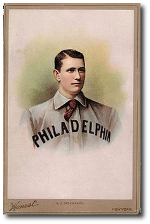 CLICK HERE if you want to sell your 1893 N142 Duke Cabinets Baseball Cards.